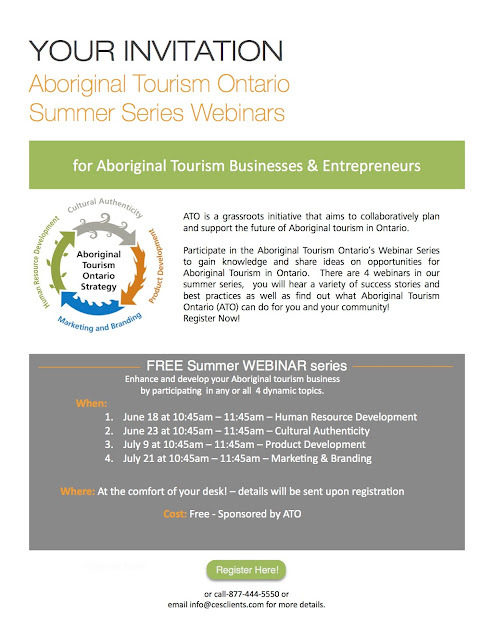 Register Now for the Aboriginal Tourism Ontario Summer Webinar Series! I recently had the privilege of spending one week in Moose Factory to kick start their My Community App project. The My Community App project aims to celebrate the people, the land, and the history of the island through digital storytelling. So what that entailed was me travelling to the island equipped with some camera equipment to start the process. When everything is ready to go all the information will be accessible on an interactive website that functions as an app on your tablet and smartphone devices. People will be able to visit the site and learn about the stories from Moose Factory and its people through videos, photos, written stories, and maps. What makes this project so special is that it just doesn’t stop after we (Canadian Ecotourism Services) finish our contract, this project is a legacy project and the community members are given the training, the tools, and resources in order to carry it on and add new content for years to come. The community’s Youth Centre is taking the lead to make this project happen! I had a wonderful time connecting with the staff at the Youth Centre and it was so great to experience the incredible work they are doing for Youth in the community. and take some video footage of. It was so refreshing being in a community that values family, friends and traditions before anything else and witnessing the Elders, the young kids and everyone in between partaking in this event was amazing. I personally enjoyed when the Elders were delegating tasks to the younger generation to teach them everything from how to pluck and gut the geese properly to how to know exactly when the geese were finished cooking over the fire. They also prepared and roasted some delicious bannock over the fire and again had the kids involved with that. The feast was held in a sabtuan, a large teepee constructed for gatherings and cooking. The smell inside was incredible and the community members were so excited to cook the geese this traditional style. The community still takes a traditional two week break each spring to head out to the bush to hunt for the spring geese. The community is literally a ghost town during this time. Most families prepare their geese roasting it in an oven so going back to preparing the geese the traditional style is a nice treat. The Youth Centre is actively involved with teaching the Youth traditional activities to connect them to their culture. They have regular after school programming with activities such as drum making, beading, and they take part in a lot of events such as ice fishing, preparing fish in the sabtuan, and learning skills on the land. It’s evident the engrained connection the people have to the land. Living on an island also has a lot of stories attached to that too – I can go on forever sharing some of the conversations that I had so I’ll just have to refer you to check out their App to learn more about the community once it is up and running. The Community App is anticipated to be launched this August – so stay tuned for the announcement. If you are interested in hearing more stories about the My Community App and my experience in Moose Factory contact amanda@cesclients.com. The My Community App provides a platform for a community to share their story in an engaging way on a customized interactive map that will highlight information about the culture, people, history, artifacts, significant sites and elders’ stories in a dynamic format. This is a community-driven initiative that involves the youth, elders and everyone in between. The community members are given the tools and knowledge to interview each other to capture stories through video, audio, photos, and written text. The project empowers the community members to set direction and pass on local knowledge and experience to the next generation. The My Community App Project focuses on the preservation of culture and history. This Project celebrates culture by sharing people’s story through community-driven storytelling, interactive maps, a digital living museum and a virtual-sharing circle. In addition, the My Community App is easily expandable and has the ability to incorporate language learning applications within its framework. We included options to add a language learning application into the App as well as options for integrated live streaming. Upon approval of this concept we will prepare a more detailed proposal and budget. 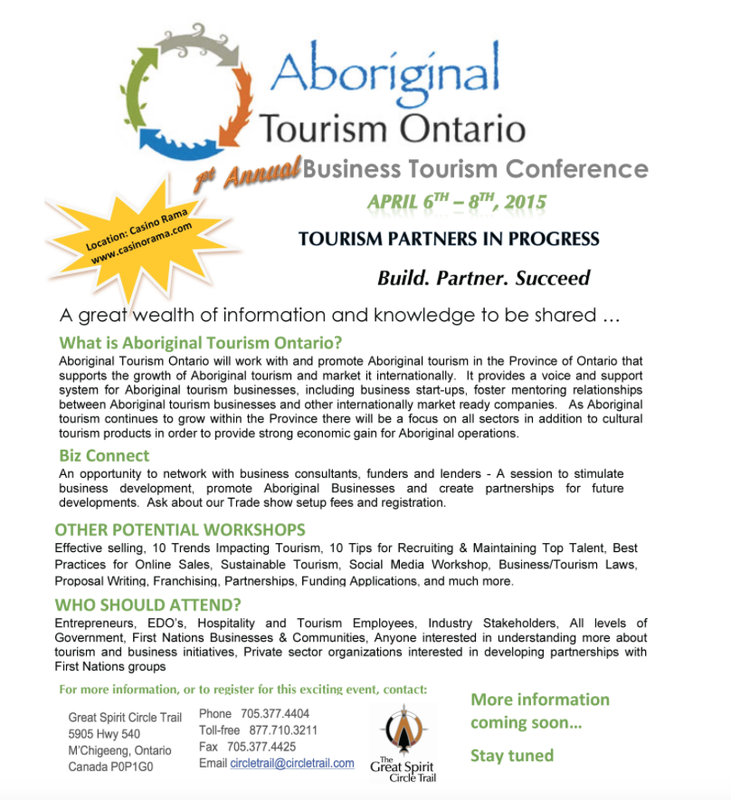 Aboriginal Tourism Ontario’s 1st Annual Business Tourism Conference! Register now for Aboriginal Tourism Ontario’s 1st Annual Business Tourism Conference at Casino Rama! For more info or to register contact circletrail@circletrail.com. I’ve been travelling to India for the past 4 years and this year had an opportunity to explore the small villages of Odisha (Orissa) on a FAM tour. I created a partnership with Heritage Tours, a company that specializes in customized cultural tourism experiences in Odisha and other regions throughout India. The focus of this trip was to experience the indigenous culture in the tribal communities.After a long journey from Canada, I arrived in Visakhapatnam, or Vizag for short, and started to travel directly to Desia in Koraput in order to make it to the tribal market on Thursday. Desia is a community based rural tourism initiative developed by Heritage Tours, the Bantalbiri Village, and a local NGO Barefoot. This initiative focuses on building the capacity and creating economic benefits for the local villages through grassroots tourism as well as empowering local communities to celebrate and preserve their cultural traditions. So many tourism companies claim that they are sustainable and offer authentic cultural experiences and as a tour operator we want to ensure that these claims are in fact true before we start sending clients their way. I was very intrigued with the Desia initiative and was so excited to witness it first hand. I kept struggling to fight my jet lag while on the 5 hour drive to my destination and was wondering what I was getting myself into, since it was now dark and we were travelling on some pretty rough roads. At around 8pm in the evening, I arrived at Desia and received such a warm welcome from the staff. And I was amazed at the site – the rooms were absolutely beautiful and it had such a good tranquil feel to the place. I instantly felt like I was going to be in good hands. Upon arrival, I was invited to visit a nearby tribal community to see a celebration for a young girl that has just reached her maturity. Despite my urge to want to go to bed after travelling for 2 days straight, I splashed some water on my face and powered through. It was non-stop singing and dancing and was really interesting to see how alive the tribal culture still is here. I also had my first taste of the local drink from the palm tree, which was nice and refreshing and I recommend trying. The next day we hopped on a local bus to experience the famous Thursday tribal market. People from the surrounding indigenous villages travel long journeys to sell, trade, and buy local supplies and food, as well as to partake in the tradition of selling and drinking the local alcohol. Men, women, and even children were drinking and this tradition has been going on for years and years. It’s nice to find a spot to sit down and to take it all in. To respect the local villagers you are not permitted to take photographs of the people. Photography is permitted in the small villages around Desia and in other local markets. Best thing to do is just to ask your local guide if it’s possible to take photographs. It was so amazing to see how rich the culture still is in the indigenous communities and the guides with Heritage Tours are so well connected and respected amongst the locals that you always feel safe and secure, and the knowledge of the guides is unmatched. The place has such a great feel to it, and I started to connect with the Desia girls – the young ladies from surrounding villages that work there. I had an opportunity, to visit a few of the girls villages and met their families. That’s one of the things I love the most about travelling off the beaten track, you get a chance to build relationships with the people you meet along the way. The genuine kindness of strangers always amazes me. Families that hardly have anything invite you into their homes and off you food and drinks. They even offer to feed you themselves! Even though many of the villagers can’t speak English, you have the welcoming feeling that they are happy to have you in their home. Desia is a place designed to build bridges between cultures and get a real feel for local community life. It’s best to keep an open schedule and go with the flow since there are small local events and festivals that are always taking place. I loved just going for walks and visiting the surrounding local villages. We also had a picnic with the staff at a beautiful waterfall and it was a nice outing to just hang out with the staff and relax in a beautiful setting. In all of my years working within the tourism industry as a consultant, a tour operator, and a traveller I’ve never come across such a great model that has actually been implemented and having amazing results with the community members. For those of you interested in learning more about this project and/or to plan a potential best practices tour to visit the site contact amanda@cesclients.com for more details.